The Full Version Download is NOT a watered down Demo Version, it is the Full Version of the Licensed Software ... it just has an Expiration Date. Please NOTE: We do NOT provide support for Windows. Read the RV Training Help (with on-line videos), available from the Main Panel Help option (upper left). There are also Detailed Help files from almost every panel. If you encounter an RV Park problem, PLEASE contact us. If you are unfamiliar with computers and using software, please get help loaclly. The cost of the software doesn't cover Training. Thanks for your understanding. It offers 10 types of sites or units that you define. Examples: Motorhome; Boat Slips; Cabins, Storage; etc. Each of the "Other" charges can also have a quantity against them. Up to 3 Taxes can be defined, charged and tracked against each billable item. Control which taxes are used for Rents and Other Charges. There is a 4th Tax for Electric, if needed. You can Tax rent by Rental Type (Daily, Weekly, Monthly, etc.) You can even turn off Taxing for a specific Guest, like a Guest staying for over X months when Monthly is usually Taxed. 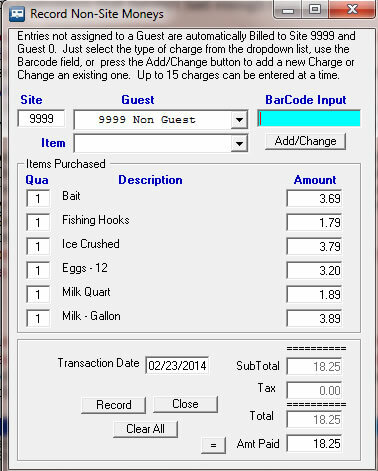 Or you can even select which Taxes will be charged by Guest. Some Parks need to change which Taxes will be charged after a Guest has been with them for some length of time. Rental Percentages for your Sites based on Daily/Weekly/ Monthly/etc can be generated. Create a Report for Other Charges with calculated Sales Taxes. The Reports have been enhanced to provide a Selection of areas to be included in the Outstanding Balance Report. The User can determine if they just want the Outstanding Balance (Unpaid Balance); Rents due, separated by Rate Type (Day/Week/Month/Quarterly/Bi-Yearly/ and Yearly); Electric Due; and Other Items Due or any combination of those. Complete and detailed Help files documenting the software, including a Training/Quick setup Help file. If 30 days is not enough time to finish your evaluation, you can get a Key for an additional 30 days on-line. There is even a 90 day Key for Customers that haven't had enough time with 60 days, just contact us. Provided the ability to Email a Reservation Confirmation and review/change the text before sending. Provides Summer & Winter Rates for Daily, Weekly, and Monthly Billing. The 3, 6, and 12 month Rates are not affected. Each Site can have unique Rates for each Billing type, or you can now use the Default Rates to standardize all sites. Prorate Weekly or Monthly rates or turn off prorating to charge the full Weekly or Monthly rate. There is even a feature to round up the Daily rate for Weekly or Monthly and Bill for the actual days. There is a Bill Extra Days Guest Rate option for Weekly and Monthly Guests that need to extend their stay by a few days and the Park doesn't want to prorate their Bill. If you want to charge the Weekly rate plus the Daily rate for the extra days. This does that, oppose to prorating the Bill. The Reservation Grid window allows Full Screen viewing and by changing the Grid Days in the Park Setup panel, you can have as many as 190 days on screen at one time. NOTE: The more Grid Days you have the slower the Reservation Grid window will update. You can Check for Program Updates on-line from the Main Panel Help Menu. Has a Point of Sale capability, complete with Hand Held Scanner Item entry capability and Inventory control for supporting a Park Store. You can have up to 15 line items in a single Sale. You can Export information to other programs like QuickBooks via an Excel spreadsheet (up to & including Excel 2013) or CSV file. Save Export structures for reuse and define Filter or Query statements to tailor your output. Electric Meter Readings can be updated through a single panel for those Paying or not paying for Electricity. Print sheets to collect the readings. Up to 4 Park Maps YOU create and update with NO EXTRA COST. We provide a simple tool to create the Maps, you provide the Map Images and about 30 seconds per site to build your Maps. Mouse over Site Box for Guest and Arrival & Departure Dates. Includes a US, Canada, and Australian Zip/Postal Code database for easier Guest Registration. You can actually add new codes as they occur. 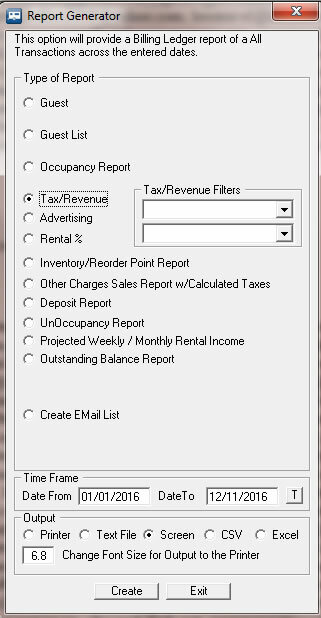 Includes a Data Importer application to aid in loading Site, Guest, & Point of Sale Items from a Previous Computer based Property Management System from existing Excel of CSV files. An Event or Facility Calendar to schedule or book time frames, you can set the colors and print for posting. Create as many Facilities for Calendars as you wish. Arrival and Departure Lists to help with preparing for Guests to Leave and Arrive. Also, be able to print Guest Notes on the Lists (up to 105 characters). Receipts are numbered and reports reflect the numbers. The receipt numbers can be set in the Park Information panel. Automatically Upload and Download a Backup of ALL pertinent RV Park files to E-Business or for trouble shooting issues or as a Remote Backup with the push of one button. Added a Toggle using Double-Click to the Guest Panel Name field to toggle between Last, First and First Last name. Added a Left-Click option to the Guest Panel Save button to just Save the Guest Information and not validate that Guest for a proper Reservation. This is just to update Guest information when they are NOT making a reservation. There is an automated Software Update capability that Exits RV Park and Downloads and runs the RVParkUpdater program and then Re-Starts RV Park Software when initiated by you. Keep track of Check Numbers Guests provide at Billing time. RV Park needs dates in the Format "MM/DD/YYYY", so it will temporarily set your computer's date format to what it needs to avoid problems, and then when you Exit, it will return your computer's date to your previous setting. You can OverRide RV Park's Guest Rate calculations (should you so choose) with a Password and enter any amount you want. 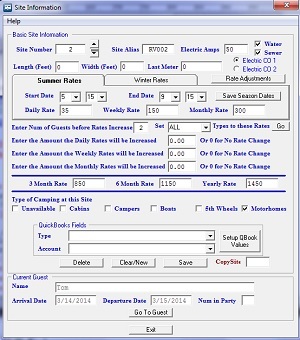 See when Guest needs to pay Rent from the Reservation Grid Panel as well as Guests that should be Checked out. 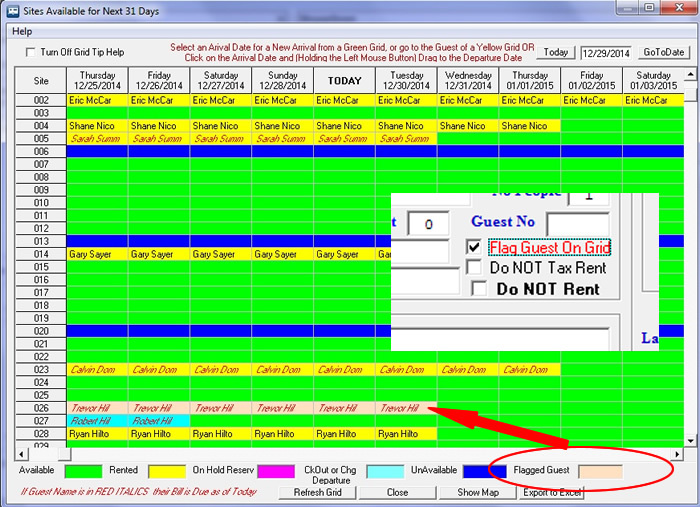 Red Italics are Rent Due Guests, and Light Blue background Guests should be checked out. Track How a Guest Found Out About Your Park. Determine where your Advertising Dollars can be more effective. 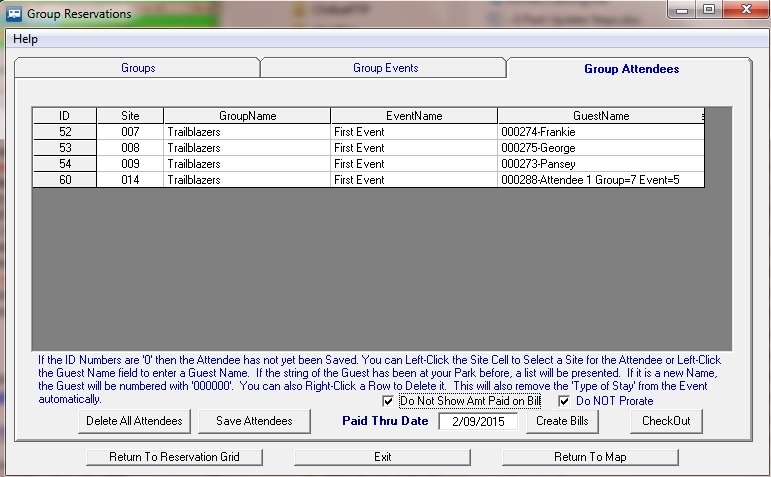 Define your own Phrases for tracking, and create a Report with Counts of the Guests and Guest History counts. Automatically Email your Database to someone for them to use the Lite version of RV Park Software for Reports or just seeing the activity. The LITE Version is FREE, you just can't Save anything. A Guest can be assigned a Member Number, if required. This is a 12 character alphanumeric field. RV Park is designed for RV Parks that have "Sites" for rentals, but you can change the term to something else if it is more appropriate for your needs, like "Room" or "Slip" or "Berth" ... up to 7 characters. Added the ability to "Stretch" the Guest, Campground Information, and Group Reservation Panels to Full Screen or anywhere in between. For those of us that have difficulty seeing small panels. There are a lot of features for $425.00. The price includes any upgrades for 12 months. Note: We are still giving existing Customers FREE updates after Ten plus years. New Customers Click HERE for a New Installation FREE trial use for 30 days. NOTICE: If you already have RV Park do NOT Download the complete application setup. Click HERE and get the Update.